In the cold dark days of January, we often look to some of our favourite comfort food to keep us going. There is something about eggs that can hit the spot. A slice of warm tortilla cooked simply just with potatoes or with extra onions can be just the ticket. Getting the seasoning right is crucial as well as being sure not to overcook the eggs. It is a dish that takes eggs away from just being a breakfast dish into a lovely snack or light lunch. 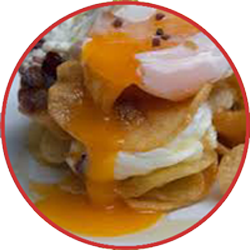 Another favourite is huevos rotos – quite literally broken eggs. You slice and steam potatoes and then add a fried egg with a runny yolk on top, breaking it so it runs over the eggs. Extras include fried onions, garlic, green peppers, chorizo and black pudding. Perhaps not a dish if you are catering for a large party but certainly one for a Sunday supper at home. Delicious!